Roast the poblanos directly over a gas flame or under a broiler, turning occasionally, until they are charred all over. Transfer the poblanos to a bowl, cover with plastic wrap and let cool. Peel the poblanos. Using a small, sharp knife, make a small lengthwise slit in each one, near the stem end. Using kitchen scissors, carefully cut out the core and seeds, then remove the core and seeds without tearing the poblanos or enlarging the opening. In a bowl, combine the grape tomatoes with the diced avocado, onion, cilantro, jalapeño and lime juice and season the salsa with salt and pepper. 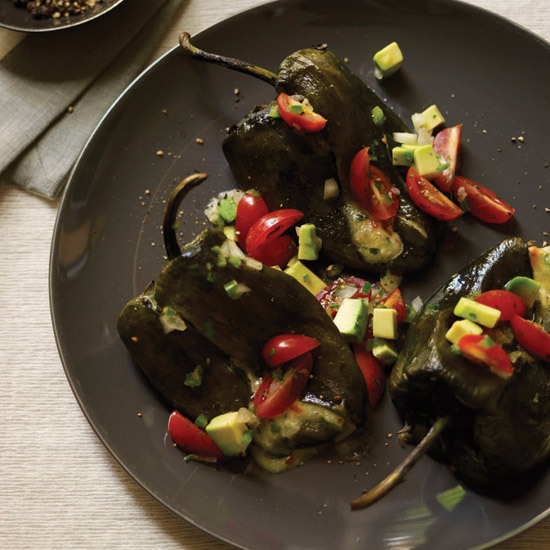 The unbaked stuffed poblanos and the tomato-and-avocado salsa can be refrigerated separately overnight. Bring the chiles rellenos to room temperature before baking. Poblano chiles are generally mild, but occasionally they can be pretty spicy, so beware. Here, Gail Simmons stuffs them with a mix of pungent Parmigiano-Reggiano and mild Monterey Jack cheese, which is ideal for melting.